Transport your guests to the sultry tropics with the flower details showcased in this calypso inspired color scheme. 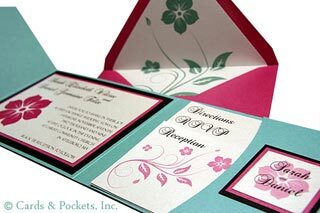 This Vertico Pocket Invitation features a Lagoon, Azalea and Onyx color scheme, paired with tropical floral elements and classic Monogram style. Pair this with one of our tropical flower custom shapes, and you’ll be ready to slip into a pair of sandles and enjoy some sun! how far does the pocket come up on the right side here? I love these!! My fiance and I are getting married in Hawaii in July and this is exactly what we are looking for. How much did they cost? I’m in LOVE with this invite suite. My wedding color is turquoise with orange and pink accents. This would be perfect, minus the black invitation mat and monogram backing. I would replace that with a paper that has some pink and orange design of some type. Is there a way to get this invite suit customized?